What's Blooming on Harrison - May 18, 2019 - Oak Park-River Forest Chamber of Commerce, IL ? 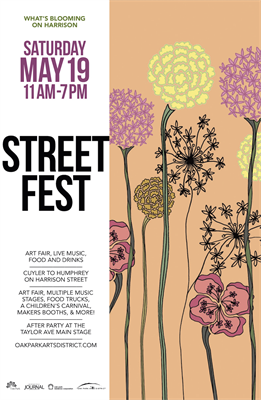 The Oak Park Arts District invites you to come celebrate the vibrancy of the Arts within our small-business community during May’s annual street festival, What’s Blooming on Harrison. Join us on Saturday, May 19th from 11am - 7 pm. 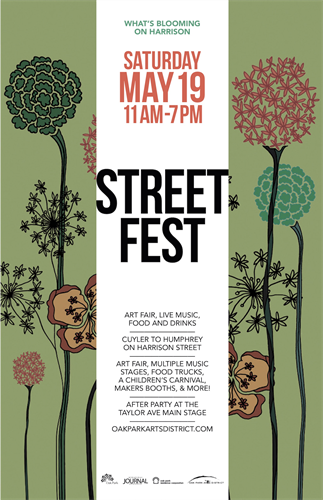 Harrison Street closes from Cuyler to Humphrey for an art fair, multiple music stages, food trucks, a children’s carnival and makers booths. An After Party at the Taylor Avenue Beer Garden and main stage runs until 9pm. Details can be found at www.oakparkartsdistrict.com. The Oak Park Arts District. Harrison Street will be closed from Cuyler to Humphrey. Saturday, May 19th from 11am - 7pm. With an After Party at the Taylor Avenue Beer Garden and main stage running until 9 pm.